A Los Angeles lawyer was arrested this week for heroin trafficking, according to court records. Glen Hunsberger, 46, was named in an August 26 felony complaint detailing how he and several associates have been the target of a year-long federal investigation into drug distribution and money laundering. On Monday, Hunsberger was stopped by Transportation Security Administration officers at a checkpoint in the Dayton, Ohio airport. A duffel bag he was carrying held more than $90,000 in cash. During subsequent questioning by federal agents, Hunsberger claimed to be transporting the money to Las Vegas on behalf of a man whose name he did not know. While contending not to know the man’s identity, Hunsberger referred to him as a “client” who works in the clothing industry. Hunsberger said that he has made over 10 trips to Ohio to pick up cash, which he then flew with to Las Vegas (before driving the money to Los Angeles, where it was picked up by “Carlos,” his client’s representative). The criminal charge against Hunsberger stems from a package of heroin that was mailed last year by an associate of the attorney. Last month, a search of Hunsberger’s Las Vegas home turned up 20 pounds of marijuana, half-a-pound of crack cocaine, and assorted drug packaging equipment. According to the U.S. District Court complaint, Hunsberger was arrested in 1994 for “possessing three kilos of cocaine and $33,000.00 in a Las Vegas hotel room.” The document does not detail the disposition of that case. In June, Hunsberger celebrated his birthday with a trip to Disneyland. 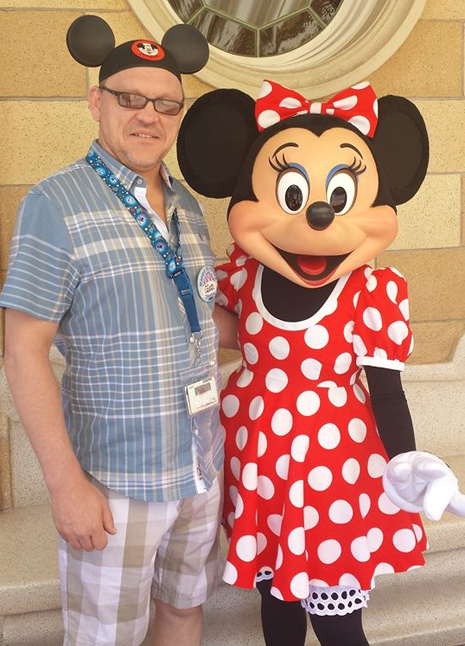 As seen above, he was spotted meeting at the California amusement park with Minnie Mouse. The Disney figure, however, has not been implicated in the lawyer’s alleged drug distribution or money smuggling.